Cathie Bledsoe, an Indiana Crimes Against Children (ICAC) Youth Educator will be at Forest Ridge Academy to provide a Cyber Safety presentation for parents. Technology changes all the time, and children are constantly finding the newest websites, apps and gadgets. It’s vital that we learn the rules of internet safety so they can use technology responsibly. This parent meeting is for adults only. Friends and relatives are also invited! 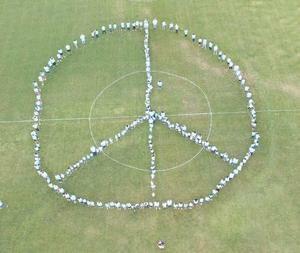 Forest Ridge Academy will celebrate the International Day of Peace on September 21st with a gathering, many activities, and an all school peace project! This year's international theme is the right to peace! Bring your lawn chairs and cheer on our soccer players at the 8th Annual Jeremy Giovanelli Soccer Tailgate Party. Concessions will be available. Join us for our all school Bonfire Hayride at Oak Ridge Prairie on Wednesday, September 12th from 5:00 p.m. to 7:00. Looking for rewarding and enriching summer programs? Look no further than FRA! We offer a variety of fun and educational summer classes and camps. Click to find out more! Forest Ridge Academy is celebrating 35 years on July 28th! Mark your calendar to attend our first-ever all school Homecoming to cap off our 35th anniversary featuring Hender-Monti competitions, garden party reception honoring your favorite teachers, Alumni recognitions, dinner with your friends and classmates, and to top it off a real Bonfire and Smores for dessert! All events to be held under the tent on the campus of Forest Ridge Academy. Mrs. Arnold and Mrs. Bach will be riding their bikes 100 miles on May 22nd to raise funds for Science, Technology, Engineering, Arts, and Mathematics (STEAM). Training has begun! Our school is partnering with the American Red Cross to host a blood drive on Thursday, April 19, in the Forest Ridge Academy Gym from 2:00-6:00 PM. Our Book Fair will be held from March 12-16! The hours are 8:15-4:00 P.M. The Book Fair will be held in our gym. FRA eighth-grader Adam earned second-place honors in the First District for the Patriot's Pen Youth Essay Award Citation, sponsored by the Veterans of Foreign Wars. The First District consists of Lake and Porter Counties as well as the western and northwestern townships of LaPorte County! Adam received a pin and a check for $200 from the VFW. While we have had numerous winners in the local competition, we believe Adam is the first FRA student to place in the First District. Congratulations Adam!